← The 2015 Meeples Choice Awards Voting Have Begun! Papayoo was a pleasant surprise when it arrived from Gigamic. You’ve probably heard of Gigamic – they are best known for their wooden abstract games – such as Quoridor and Quarto. However, in the past year or so, they have been making a push to get into the family game (i.e. non-abstract) market. Many of their current games are small format games sold in tins. 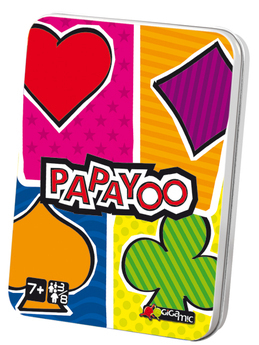 Papayoo is an interesting card game – the game consists of sixty cards – four “traditional” suits (called clubs, diamonds, hearts and spades) from 1 to 10, and a special fifth suit, called Payoo – numbered from 1 to 20. The final component to the game is an eight-sided die which has two faces each for the four traditional suits. The game itself is a trick taking game in the vein of Hearts. Your goal is to collect as few points as possible. The pain suit is the Payoo suit, with each card in that suit being worth the same number of points as it’s rank. There is one other point bearing card in the game, the Papayoo card – it will be one of the four cards of rank “7” of the traditional suits. More on this in a bit, but it’s important to know that the Papayoo card is worth 40 points. This brings the total point value of the hand to 250 points. The deck is shuffled, and in a four player game, the entire deck is dealt out. Players then get a chance to sort their cards and see what they’ve got. Then, each player takes five cards and passes them face down to the player on their left. When all players have secretly and simultaneously chosen, all players pick up their new packet of 5 cards to see their new hand. At this point, we now figure out what the Papayoo card is. Prior to the pass, you know that it will be the “7” rank card of one of the four traditional suits, but not which one. After cards are passed, the die is rolled. Whichever suit is shown on the die determines the identity of the Papayoo card. Now – play is started. The player to the left of the dealer leads the first trick. He may choose any card that he likes (even a Payoo suited card). Play then moves clockwise around the table. Players MUST follow suit if possible. If they are void in the led suit, then the player is free to slough any card. Once all players have played a card, the player who played the highest card of the led suit wins the trick. He collects all the played cards and then leads the next trick by selecting any card in his hand. This continues until the hands are exhausted and all cards have been played to tricks and collected. At the end of the hand, players total up the points in their collected cards. Again, points are scored for every Payoo suit card that they have collected as well as forty points for the Papayoo card. All other cards have no value. I’d highly recommend a phone app to record the scores as they can get pretty high. The game then continues on for a pre-determined number of hands. In our group, we usually play until each player has had the chance to deal once. At the end of the game, the player with the least points wins the game. Papayoo is a deceivingly complex game. 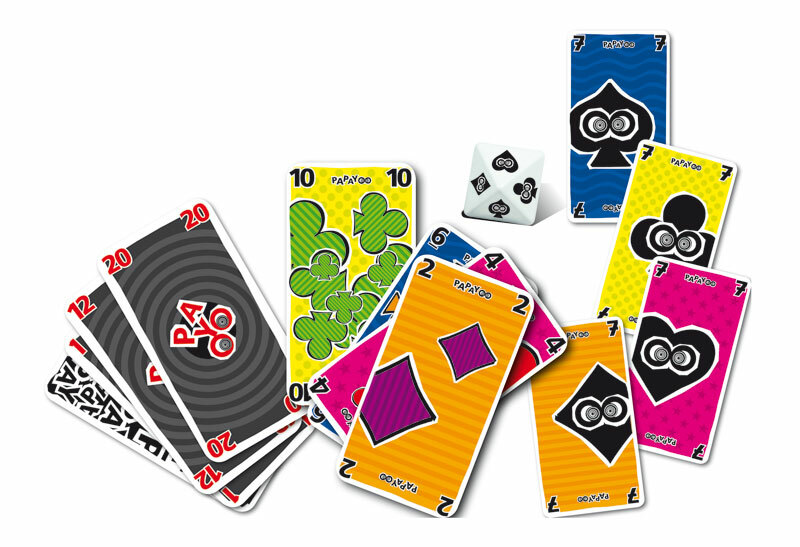 When I first received the game, I thought that it was just going to be a simple family game – the box artwork is simple and shows the four traditional suit icons, albeit in dayglo bright colors. The game does have a lot of traditional card game feel to it – anyone familiar with Hearts should be able to pick this up in short order. There is a fair amount of decision making in the pass. Ideally, you’d like to be void of at least one suit so that you can slough off your point cards on other players from the very first trick – and make yourself invulnerable from picking up points when that suit is led. However, if you empty yourself of cards in a suit by passing, you run the risk of getting passed a solitary high card (7 or higher) which then significantly increases your risk of getting the Papayoo card… Furthermore, since you don’t know which “7” will become the Papayoo, you have to be on your guard in all four suits during the passing period. Cardplay is fairly standard. In general, you want to avoid taking tricks, or at least take tricks that do not have high pointed cards in them. There are plenty of times when it makes sense to take a lower scoring card (or two) – say under ten points worth – in order to get a dangerous card out of your hand and prevent yourself from taking a much higher valued trick later on. I’ve seen someone take a 67 point trick before, so limiting your losses can be a valid strategy. Papayoo plays quickly, with each hand taking maybe 5 to 7 minutes now – so our entire 4 hand game usually takes 20-30 minutes. The art is whimsical and bright, and my only complaint of the graphic design is that it is somewhat difficult to easily see which suit is rolled on the d8. The d8 could honestly be a d4 as there are only 4 choices, but I can see where it would cause even more issues trying to explain how to read a d4 in a game that is clearly targeted at non-gamers. The game is also marketed at an international audience. The rulebook has an astonishing twenty-four different language translations, so I would think that about 90% of the world’s population could pick up this game and have a decent chance of figuring out how to play it. Given it’s broad reach – simple enough to be taught in 5 minutes, even to non-gamers, and the seemingly endless rules translations in the rulebook – this looks to be a good game to keep in a travel rucksack; it can be pulled out to play with whomever is around you; it also would make an excellent impromptu present for anyone that you might meet from anywhere in the world.